This year my co-worker Matt Snow and I decided to try something different when it comes to how we attack the different essay types in AP English Language. We wanted the students to see the bigger picture, how each essay type was related rather than seeing them as three different essays. The planning and instruction didn't change for us that much, thankfully, but the payoffs, we believe, are going to be huge. We have grouped our first few texts under a common theme of knowing one's self--specifically learning to read and write alongside identity. For this we used three excerpts from the textbook 50 Essays, which included Sherman Alexie's "Superman and Me" and Frederick Douglass's and Malcolm X's "Learning to Read and Write" from their autobiographies. For each text, students worked with individual writing skills alongside comprehension and active reading strategies. For example, we worked with thesis writing, paragraph-level evidence and analysis practice, as well as ethos/pathos/logos from our textbook Everything's an Argument. Additionally students have practiced paragraph-level and verbal argumentation practice using professional, self, and peer samples. Now we were ready to put all of the practice together. The students brainstormed and planned an argumentative writing prompt on the value and function of grades in schools when it comes to learning (building from a summer reading excerpt from Zen and the Art of Motorcycle Maintenance). 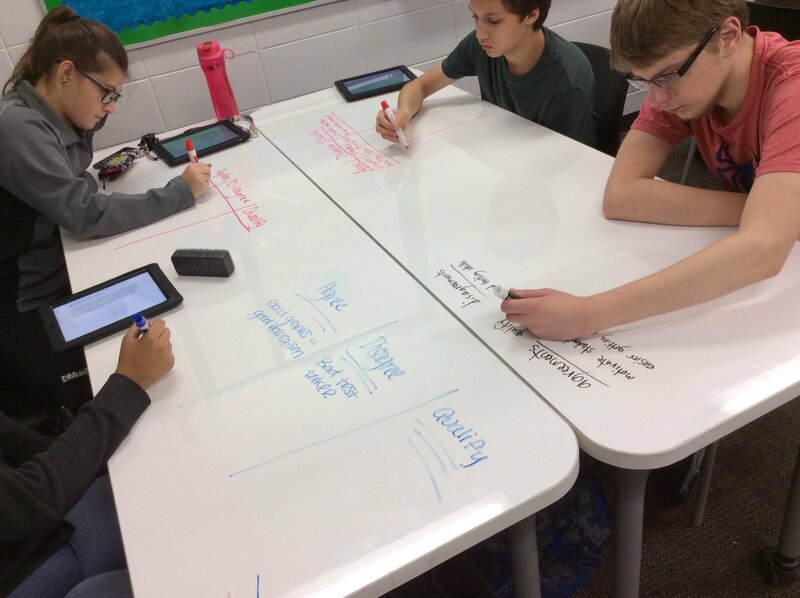 Students used the dry erase tables to plan their thoughts and then walked around to give each other feedback. We then worked to plan out argumentative thesis statements, brainstorm evidence, and plan out outlines--not 5-paragraph papers, but the best way to convince someone in the argument. After writing their essays, students then set them aside, which was strange to them. This week we began a rhetorical analysis prompt on the same topic. In fact, most of the prompt was word-for-word the same as the argumentation prompt. We used Rebecca Schuman's article "I Give Up, You're All Exceptional" and analyzed her writing for strategies and purpose. Again, students brainstormed and outlined together and then wrote a draft on their own. Next week we will put the essays side-by-side. Students will look at the similarities and differences in argumentative and analytical writing and what specific elements change for which task. We also are challenging the students to look at themselves as writers: what did the author do in her writing that they could try in theirs? They will then peer edit and revise both essays before submitting. The last task will be a synthesis/DBQ prompt in 2 week using all of the texts we have dealt with this quarter--so, again, on the same topic. I will report back after that with how it all went! My students have started a draft of the AP Essay type breakdown. While their language is not was ours would be, they are really good at noting the differences between the two types we have done so far. It will be nice for them to see their draft and then compare it to the handout we made this summer with our friends in history.